Jan is from Komen in Slovenia EU. He is 14 years old and very proud of himself for shooting 6 of the wild boar pictured below. 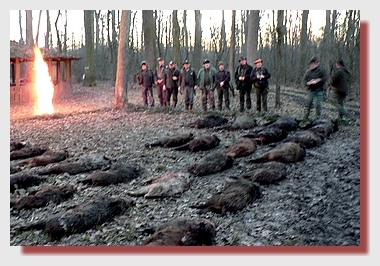 The hunt took place in Belje, Croatia. Jan used GSC calibre 375, 265gr HV bullets in a .375 H&H flanged, Victor Sarasqueta, side by side double rifle. The exit wound is actually behind the shoulder and the pink matter is froth, with a chunk of the lungs.